Welcome to Shangri-La International Festival of Gastronomy! The festival is a celebration of our passion for cuisine. We have invited our celebrity chefs to share their fruitful and exciting culinary careers with you. This series comes to an end with Chef Ip Chi Cheung, the Executive Chinese Chef of Island Shangri-La, Hong Kong. 1. What makes you keep your enthusiasm to contribute in Gastronomy of Cantonese Cuisine? Ip: In my perspective, the key element of Cantonese Cuisine is the mixture of Appearance, Smells, Tastes and Temperature which is not easily replaced by other cuisines. For instance, the cooking process of Fusion Cuisine requires separate processing and pre-processing of the ingredients. Perhaps I first started my career in Cantonese Cuisine; I personally think dishes in other cuisines are lack in temperature and aroma, which is unique in Cantonese Cuisine, such as stewed fish and braised abalone. 2. What are you going to achieve in the coming stage? Ip: Being a chef for many years, I sincerely hope that the young generation can be interested in working as a chef of Cantonese Cuisine. We can share our experiences with them so that the cooking culture of traditional Cantonese Cuisine can be inherited. In the current situation, the industry lacks in manpower because the number of the young generation’ intake is consistently declining. In 1970’s-1980’s, especially for illegal immigrants, working in the kitchen is favorable because it provides meals, accommodation, and salary. Nowadays, working in the kitchen is unfavorable to the young generation because of its long working hours and uncomfortable working condition. To emphasize, the youth are more familiarized with English and IT knowledge which allow them to use this absolute advantage to bring Cantonese Cuisine on an international stage. Due to the factor of manpower getting less in the industry, there are numerous training programmes with job opportunities in some institute to help the youth upgrade and obtain skills in Cantonese Cuisine. In order words, it is full of learning and promotion opportunities. The determining factor is the attitude, you have to take it seriously and keep practicing the techniques you have learned. 3. Where did you start your Chef Career? Could you share something unique and inspiring food culture to us? Ip: I started my Chef Career in a Chinese restaurant when I was fourteen. In terms of food culture, people are more concerned with healthy diet nowadays. Customers will look for meals that are healthy and light. Comparing to 70s’ and 80’s, many foods and meals are containing lard as it adds aroma to the food. Back in 70’s and 80’s, chef normally wear less cloth to work, because inside the kitchen is a poorly ventilated workplace, it is wet and hot to work in the kitchen. Nowadays, people put more emphasis on working environment in the kitchen. For instance, the ventilation system is installed and uniforms are prepared for Chef. 4. What would you tell our young Chef? Ip: In order to be a Chef, two main attributes are required: earnest and enthusiastic. I suggest young Chef spend time on practicing their own technique as this industry is full of opportunities. There are many types of meals in Cantonese Cuisine, making good use of ingredients and cooking methods in another country can enrich the content of Cantonese Cuisine, such as Foie Gras from France, Wagyu Beef from Japan and Black Truffle etc. Furthermore, there are many existing resources to learn cooking. Young Chef can learn fundamental skills in cooking institutes. If they are pursuing advance skills, they are advised to learn practically from different Chef in Chinese restaurant and hotels. As different Chef may have different processing skills, they have to absorb other’s strength which is beneficial to their own creation. Today’s article comes with Chef Mauro Colagreco, the founder of AZUR by Mauro Colagreco at Shangri-La Hotel, Beijing. What makes you keep your enthusiasm to contribute in Gastronomy? A true unconditional love for food, first quality raw material and driving desire to explore flavors. What are you going to achieve in the coming stage? It would be an incredible honour to be an inspiration for young chefs, this is my coming stage. Everything I achieved until now is result of my constant aim: make the most out of every ingredient to serve my clients the best food I can cook. Where did you start your Chef Career? Could you share something unique and inspiring food culture there (starting place) to us? I started in my native country, Argentina. After a foggy period when I did not know what to do with my life, I just remembered as a child I loved cooking and suddenly I got the picture, I decided to follow that enlightenment. Something unique to which I am attached is an ingredient that is part of my family history: figs. The sister of grandmother migrate from Italy to Argentina, bringing with her a branch of fig, as cultural memory of her family and Italy. Once arrived, she immediately planted it. Hence why figs have a special meaning to me. What would you tell our young Chef? 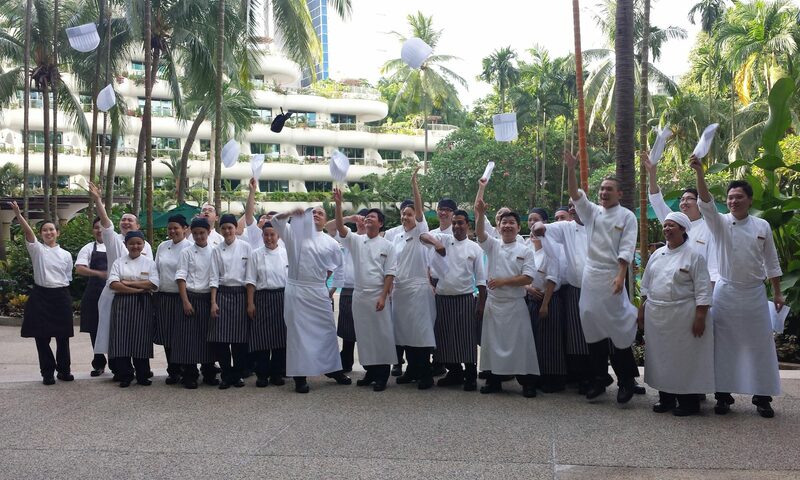 A chef’s career means a lot of hard work and dedication. Stay focused and never, never give up. If this is your path it will come out and you will be rewarded! The third chef will be Chef Samuel Lee, another Executive Chinese Chef at Shangri-La Hotel, Paris. 1. What makes you keep your enthusiasm to contribute in Gastronomy? I believed that food brings joy to people. As a chef who has the ability to cheer and touch people through enjoying food, bring me so much satisfaction thus I never bored with my job. No particular goal, just keep improving myself to achieve other and another higher level. 3. Where did you start your Chef Career? Could you share something unique and inspiring food culture there to us? I started my career path in my homeland, Hong Kong. Roasted suckling pig is really something worth sharing. For the technical part, roasting a suckling pig is a big production, steps involved including the special butchery method、seasoning、marinating 、brushing skin、drying the pig and roasting, the entire process reflecting the art of Chinese cooking. According to the information has been documented in ancient times, roast suckling pig has a long history, it appeared since the period of northern and southern dynasty (AD 420 to 589 AD). This is the beauty of preserving food culture heritage. Determined and never give up! Also, always enjoy cooking. If you want to be a good Chef, there is no secret or short cut; you have to be hard working, very hard working. This time comes up with Chef Christophe Moret, Executive Chef at Shangri-La Hotel, Paris. In our job it’s all about sharing. I am going with my knowledge and also learn and share with other Chefs. 3. How did you start your Chef Career? I started my career in 1984. I had the chance to work with 3 renewed Chefs: Bruno Cirino, Jacques Maximin and Alain Ducasse. They taught me this enthralling job and this is what I want to keep doing with my teams. While I was Chef at the Plaza Athénée Hotel in Paris, I received for a banquet; all 3 starred Michelin Star Chefs in Europe. I also had the chance to cook for our Presidents. I love this job because we have to go towards excellence. 4. What would you tell our young Chefs? Work hard and keep curious. It is important to be aware that there will always be someone who works harder than us to become the best. And also keep in mind the sharing part. With our guests, our producers, colleagues… I love this job and we have to do it with passion. First up is Chef Mok Kit Keung, Executive Chinese Chef in Kowloon Shangri-La, Hong Kong. The motivation comes from my guests. Our Shangri-La philosophy is to provide an engaging hospitality experience as one would expect from a caring family. What could be better and more enjoyable than cooking for your own family members? The idea keeps propelling my enthusiasm and motivates me to provide uniquely personalized and thoughtful gastronomy experiences to our guests as I welcome them to my ‘home’. To continue to excel from the Michelin two-star award by increasing the service standard and food quality to attain Michelin three-star award is the next-stage goal to achieve. How did you start your culinary career? I started my culinary career in a local Chinese restaurant when I was at the young age of 14. My uncle was the restaurant’s chef and he brought me there as a helper. I started from the most junior position, working from nine in the morning till mid-night every day. I started with cleaning the kitchen and keeping the place tidy and organized – I could only learn the skills and practice cooking and chopping techniques after the shift ends. What would you tell our young Chefs? The most important thing is attitude. Positive attitude towards your job and loving what you do will make you respect the food you create and work hard towards reaching your dream. Furthermore, always learn from others’ experiences and from own past experience; it could motivate you to search for new ideas on food creativity. Be serious and give your best in every dish you create, as you don’t know when the opportunity would come.